Venue: Meeting	Room #486,　Science Research Bldg 1, Ehime Univ. Abstract: Recent geochemical studies on the Apollo samples provided a challenge for our understanding the origin of the Moon. Theyinclude the confirmation of extreme similarities in the isotopic compositions between the Moon and Earth and some evidence of not-so-dry Moon. Among these, “evidence” for not-so-dry Moon is controversial and some discusses that “not-s-dry” samples are anomalies and the bulk of the Moon is dry. I will provide geophysical observations that show, indeed, that the bulk of the Moon is not-so-dry. 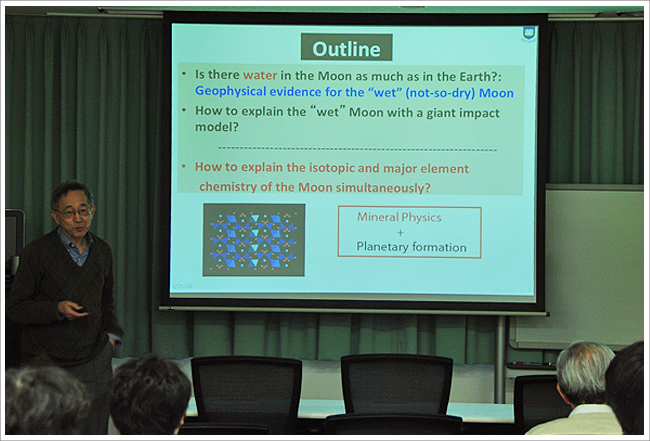 Explaining the extreme similarities in isotopic compositions and the relatively waterrich Moon in a commonly accepted model of a giant impact origin of the Moon is challenging. High degree of heating by a giant impact would imply depletion of much of water. Also previous models of a giant impact that explain the high angular momentum of the Moon-Earth system lead to the lunar composition that is dominated by the composition of the impactor. I will provide models of physical processes of a giant impact to solve these puzzles.